In Bangladesh, the peaceful co-existence between Hindus and Muslims is under threat. In recent times, the attacks on Hindu, indigenous people, and other minorities have increased as a consequence of land grabs and other political reasons. In many cases, these attacks are disguised as the actions of angry mobs supposedly provoked by personal affronts and offenses against “religious feelings.” These attacks are reportedly instigated by the country's Islamists and supported by politicians for their own agendas. On October 30, at least 15 Hindu temples in Brahmanbaria’s Nasirnagar were vandalized  by a group of 150 to 200 hooligans, who also targeted hundreds of houses in the local Hindu community. According to reports , a group of people staged two separate demonstrations at the Upazila headquarters that same day, supposedly protesting an offensive Facebook post published a few days earlier. The alleged provocation was by a local fisherman named Roshraj Das, who supposedly photoshopped an image of the Hindu lord Shiva sitting on the Muslim holy place Kaaba  sharif. A little-known website called Banglamail71.com later drew attention  to Das’ Facebook post. The content was originally posted by “Noyon Chatterje,” a Facebook profile run by Chhatra Shibir activists, that has long been instigating hatred against Hindus. The post and the news item allegedly triggered the violent attacks in Nasirnagar. Before the violent demonstrations ever began, police had already arrested Das, who categorically denies the allegations against him, saying  his Facebook account was hacked. “I do not know who posted that photo from my account,” he said, “but it wasn’t me. I immediately deleted it as soon as I saw it and I want to apologize to everyone for it”. 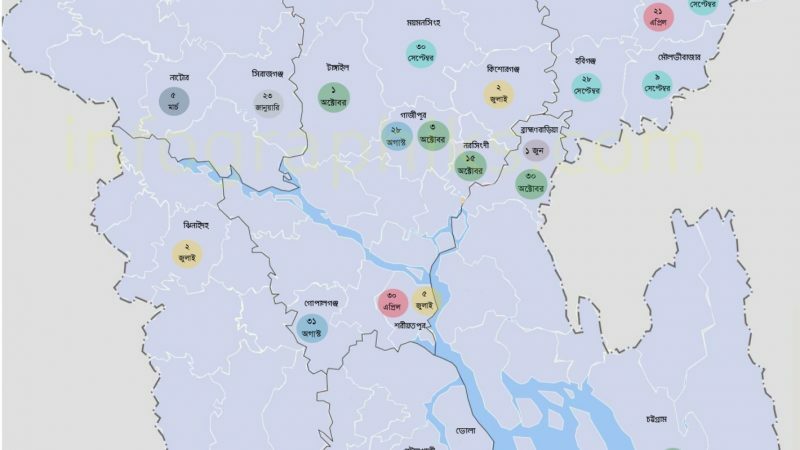 Reports say  that some local leaders from the Islamist organisations Ahle Sunnat Wal Jamaat, Hefazat-e-Islam, and even the ruling Awami League were the true perpetrators  behind the attacks. Police have identified around 50 people  from mobile videos filmed during the incident and have arrested  44 people, so far. Also, Awami League suspended  three local leaders for their alleged involvement in the incident. The story doesn't end there, however. Muhammed Sayedul Hoque, a member of parliament from Brahmanbarhia and the country's minister of fisheries and livestock, traveled to Nasirnagar two days after the attacks. His statements and reactions  on that trip, which largely dismissed the seriousness of the violence that took place, annoyed many Internet users. Later, at a press conference, Hoque accused journalists of “exaggerating” the incident. This has sparked yet more protests, now demanding the resignation  of Minister Sayedul. Some have been protesting on social media, as well, using hashtags like #IamMalaun. The community sense will always dominate as our history shows. And our rage is widespread and overwhelming over the Nasirnagar incident. We all said, ” I am a Malaun ” including myself. We have never seen such solidarity before. In a second wave of the attack, on Friday, five houses  in Nasirnagar upazila of Brahmanbaria district were emptied by demonstrators. Locals foiled  another attempt to attack their homes on the morning of November 5. For victim people of Nasirnagar, Brahmmanbaria. We are all Bangladeshi. We are all Bangali. We are not sectarian. So raise your own voice. A Muslim, a Hindu, a Buddhist, a Christian, we are all Brothers. — Raise your voice. 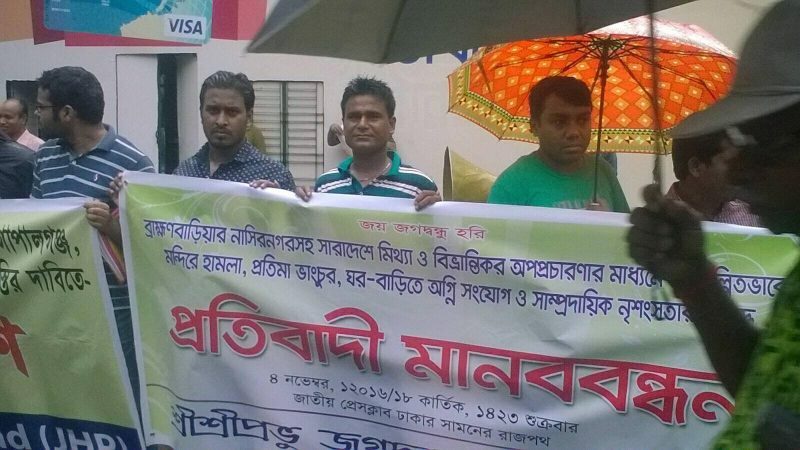 Protest in Dhaka against the brutal attack against the Hindus. Image via Megh Roy Sarkar. The Nasirnagar incident shows a similar pattern of attack against minorities, like the Ramu attacks  in 2012. There was a fake Facebook post that was reported on a suspicious news site. Then there were protests and subsequent attacks. The local authorities were ineffective in both the incidents. On November 8, 2016, in Kulaura, North East of Bangladesh, four people were detained  in connection with another incident that involved the publication of another “blasphemous image” on Facebook. The local authorities quickly took measures to safeguard the Hindu community and its property, as various groups were calling again for violence. Locals claim the offensive post was published on the Facebook account of an individual who's known to be illiterate.